Sarah Palin says she's going to play Tina Fey in an upcoming Las Vegas show. The former Republican vice presidential nominee turned into a standup comic on Jay Leno's "Tonight Show" Tuesday, dropping one-liners about the White House, Congress and Fey — the "Saturday Night Live" star known for her impression of the former Alaska governor. 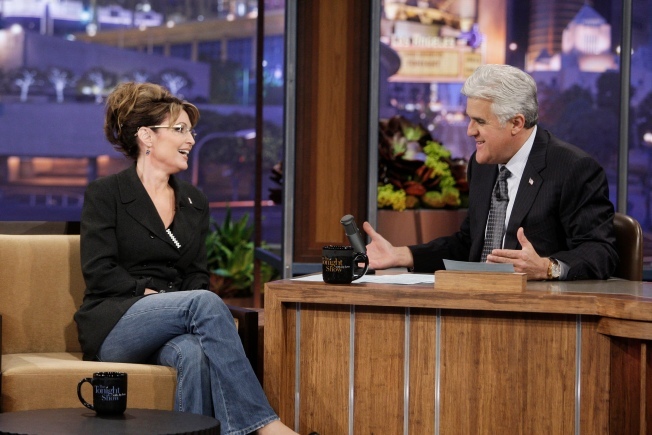 Palin told Leno's audience she planned to speak at a gun-rights convention: "Be there or else," she warned them. She said Alaska is different from California. In Los Angeles, "when people have a frozen look on their face, I find out it's Botox." And she's happy she's not vice president. "I would not know what to do with all that free time," she quipped. In remarks taped for broadcast later Tuesday, Palin said the White House health care plan reminds her of acrobatic flips done by snowboard champion Shaun White. And she joked that it's so cold in Alaska it's "5 degrees below Congress' approval rating." She had some fun at her own expense, too. Palin became fodder for late-night TV jokes when she was spotted looking at notes written on her palm during a speech in Nashville. She said she picked up the habit years ago from her father, a teacher, and "I'm going to keep doing it." Earlier, she flashed her palm, which had "Good evening and welcome to 'The Tonight Show'" written on it.